Cancers of the bone and connective tissue, also called sarcomas, are very rare. Combined, they account for about 1 percent of all new cases of cancer. Because these malignancies occur infrequently, are unique in how they present and involve a complex array of treatment options, it is important that patients seek experienced care. Sarcoma outcomes have been shown to be significantly improved when patients are cared for by a team of sarcoma specialists. As an academic medical center, Froedtert & the Medical College of Wisconsin offer an interdisciplinary team of specialists to ensure the best possible outcomes. Cancers of the bone and connective tissue affect people of all ages, and they can occur at any location throughout the body. They include tumors that develop in bone, muscle, tendons, nerves, blood vessels and fat. This is in contrast to the more common types of tumors known as carcinomas, which occur in tissues with glands. Bone and connective tissue tumors, also called musculoskeletal tumors, can also be benign. The vast majority of primary sarcomas are curable. A patient's individual prognosis will depend on the size, histology grade, location of the tumor and whether the cancer has spread to other parts of the body. According to the National Cancer Institute, sarcomas located in body organs are hard to distinguish from other kinds of cancer and are frequently misdiagnosed. An accurate diagnosis is a crucial first step in the effective treatment of bone and soft tissue sarcoma. The type of tumor, its grade and size, and whether it has spread are all factors that determine the stage and treatment plan. Diagnosis may involve X-rays, CT scans, MRIs or biopsies. Soft tissue sarcomas are notorious for mimicking carcinomas, melanomas and lymphomas. The confounding morphology of sarcoma often poses a significant challenge for diagnosis. Therefore, a sarcoma specimen should be reviewed by an experienced pathologist who specializes in sarcoma. Patients with suspected bone or soft tissue sarcoma should receive a thorough evaluation and diagnostic workup before beginning any treatment. The rarity of the disease can limit knowledge about it. Medical College of Wisconsin physicians see a large volume of sarcoma patients, and have the expertise to confirm a cancer that can be difficult to diagnose. The team specializes in minimally invasive biopsy techniques that provide fast, accurate diagnoses of musculoskeletal tumors. The program also offers second opinions for a sarcoma diagnosis through the Cancer Second Opinion Program. A second opinion provides patients with the reassurance that a diagnosis is accurate and that they know all of the treatment options available to them. Treatment for patients in the Sarcoma Program centers on the person and the disease. World-class specialists from multiple disciplines collaborate on individualized plans that are developed to destroy the cancer and to preserve or restore function. The goal is to provide the right treatment, at the right time, to the right person. Another critical facet of the interdisciplinary care at Froedtert & the Medical College is the sarcoma tumor board. Physicians and other clinical staff from the interdisciplinary team gather weekly to review and discuss cases and determine treatment. They pool their collective experience, knowledge and research findings to arrive at the best approach for each patient. This is the kind of leading edge care patients will only find at an academic medical center such as Froedtert & the Medical College. The physician team meets regularly to discuss every patient in the Sarcoma Program. Working closely together, these specialists ensure each patient receives completely coordinated care that takes advantage of every appropriate treatment option. A nurse coordinator works with every patient to coordinate physician consultations, tests, treatments, follow up care and support services. The team encourages patients to participate actively in decision making. Because of the rarity of bone sarcomas, treatment paths must be carefully examined. Patient and family involvement in looking at options and recommendations is important for identifying the best overall treatment plan. Patients in the program are often eligible to take part in clinical trials that provide access to new therapies and treatment approaches. 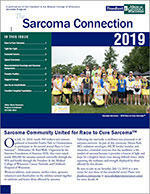 Read the latest edition of The Sarcoma Connection, a newsletter focusing on advances in sarcoma research and care. People affected by a cancer diagnosis, as well as their spouses, family members, significant others and caregivers are welcome to attend our monthly support group to share information and experiences, as well as receive encouragement and support. This monthly support group offers periodic speakers and is also intended as an open forum. Visit our calendar or call for more information: 414-805-3666 or 800-272-3666. The physicians of the Sarcoma Program are committed to providing patients with prompt access to consultation and treatment. Whenever possible, new patients are seen within one week of referral. Froedtert Hospital is recognized as high performing in 11 types of care, including cancer.